Hamishah Humshei Torah (The Five Books of the Torah). Berlin: Soncino Gesellschaft, 1933. The Hebrew word Beresheet, which means "in the beginning," opens the Book of Genesis. 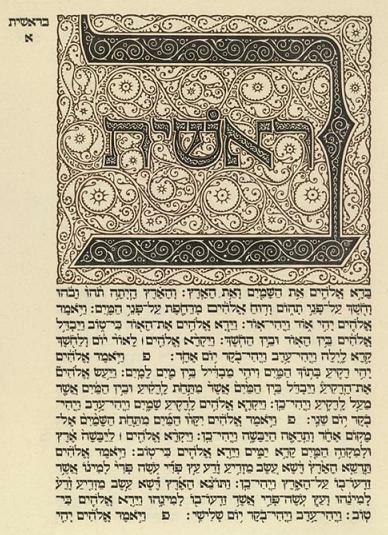 This decorated initial word is from the first volume of a planned multi-volume edition of the Hebrew Bible. The volume was published by the Society of Jewish Bibliophiles, the Soncino Gesellschaft, in Germany in 1933. Hitler's rise to power prevented the Society from completing what would have been the first bibliophilic edition of the Hebrew Scriptures.